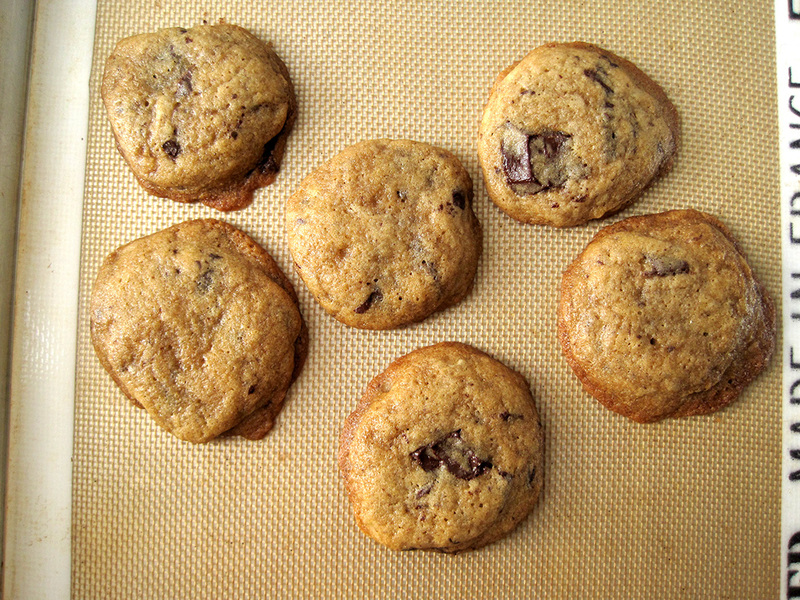 After “32 pounds of flour, over 100 individual tests, and 1,536 cookies”, Kenji of Serious Eats’ The Food Lab finally settled upon the “best chocolate chip cookie” recipe. Of course I had try this recipe worthy of a superlative, especially after such extensive experimentation. Nothing like trial and error to yield the best results, am I right? My verdict? Short answer: not the best chocolate chip cookie recipe. The long answer is as follows. 1. Spread too thin: when I first baked these cookies after a night of refrigeration, they ended up spreading and gave nowhere near the crackled, chunky effect of Kenji’s version. I then put it in the freezer and ended up the texture as shown in the pictures. 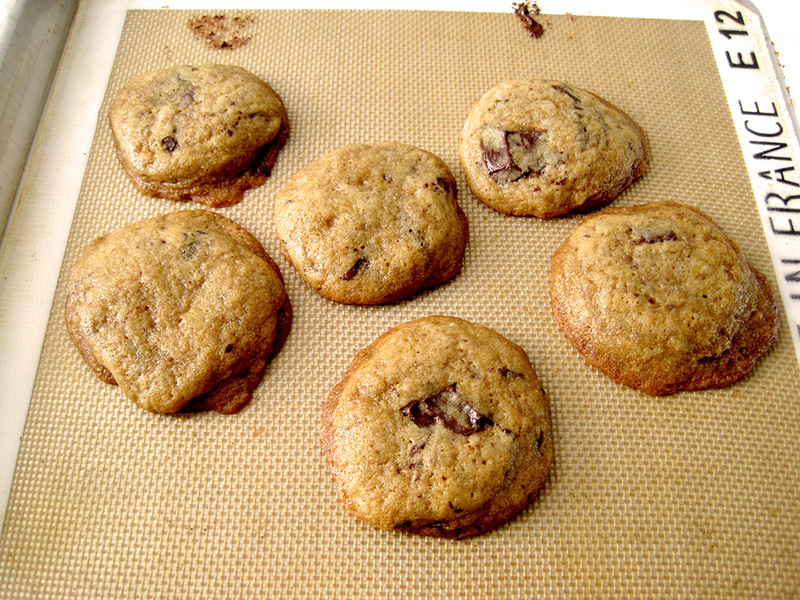 The cookies have a bit more height, but still don’t have an attractive texture. 2. Too salty: So I used Sel de Guarande, a French sea salt – which is not Diamond Crystal kosher salt, as was recommended in the recipe. From what I could tell based on my research, the fleur de sel I had was similarly, if not more coarse than Diamond Crystal – and thus shouldn’t over-salt my cookies. I was wrong. It ended up too salty for my taste and diminished the sweetness, and I am glad I didn’t garnish the cookies with more salt – that would have been overkill. Perhaps I didn’t brown the butter enough, but I thought that there wasn’t a strong enough toffee/caramelized flavor, and the taste was simply too salt-centric for a chocolate chip cookie. 3. Fluffy texture: A fluffy texture might be a boon or a bane depending on who you ask, but personally I prefer a denser, more chewy cookie. Because the eggs and sugar are beat on medium-high for five minutes, a lot of air is incorporated into the dough, lending lightness and airiness. I didn’t really care for that, personally. If I had let the butter solidify completely after browning it, that might have helped with giving a denser texture that I personally prefer. 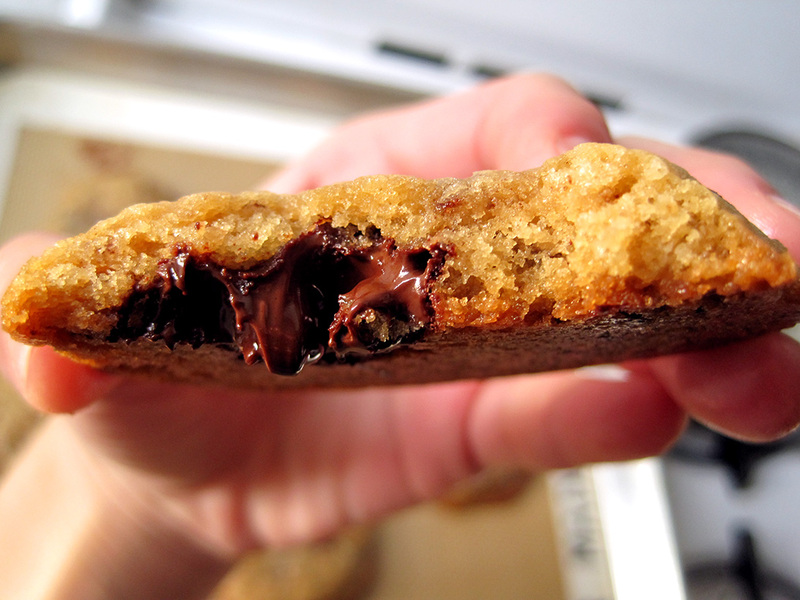 I don’t think I’ll be making this again, since clearly it doesn’t fulfill my vision of what a chocolate chip cookie should be. Did you read Kenji’s process for developing the recipe? There’s some changes you might try to get the cookie you desire. Some things that might shift your cakey cookie to something more your liking: melted/browned butter instead of creamed, more white sugar/less brown sugar, one less egg yolk, cool the butter more before mixing it in, etc. Mike, I did read his process. I realize that options to edit the recipe are available to me, but then what’s the point of a supposedly fine-tuned, trial-and-error-driven recipe if I have to do the trial and error myself? Just by looking at the finished product, I can see that the dough was over mixed. It’s fluffy and cakey because you incorporated too much air in the batter. Sure, the recipe might not be the ratio like best, but the texture and layering of flavored is compromised if the technique used over blended the ingredients. I’d say give it another shot! 🙂 I usually do a repeat if my final product varies greatly in texture and look, but don’t if it was cooked properly and it’s the ingredient list that’s the problem.